Brian Alderman is currently exhibiting paintings of the milking herds from local farms in the Dales in the restaurant of the Wensleydale Creamery in Hawes. 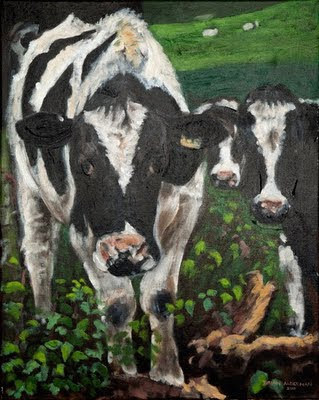 The painting above is 'Inquisitive Cows' (oil on canvas, 20" by 16", 2011). More from the exhibition can be seen here.